When I was six years old, my dad came home with an announcement. 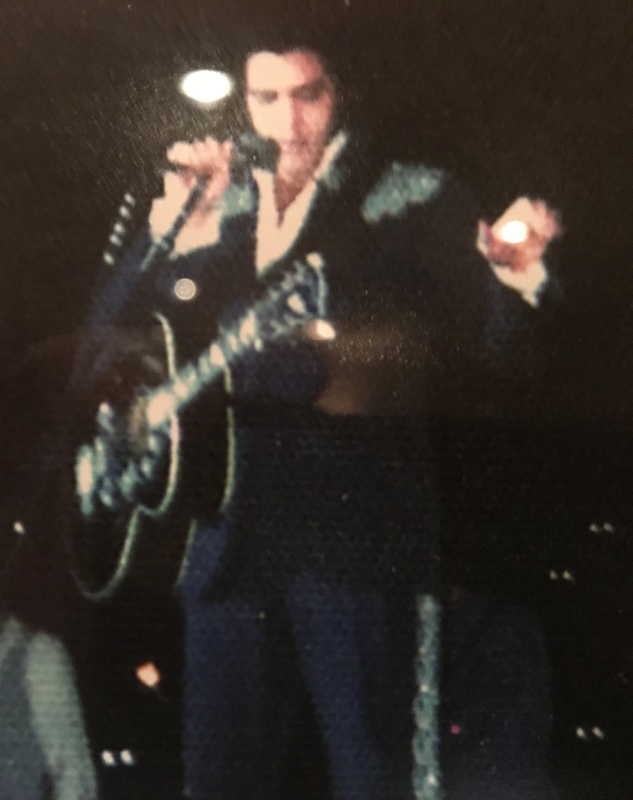 Elvis Presley was performing in a nearby town, and, through a friend of my dad’s, we had gotten front row seats. I remember only bits and pieces of the night, but this is my version of the events. As we walked into the concert venue, a basketball arena on a college campus, I noticed bright lights and a haze in the air. I assume this was the clouds of smoke from cigarettes burning throughout the arena, but it could also be the effects of my imagination. There was a bustle of excitement as we got to our seats. I remember thinking how high the stage was and wondered what would happen if Elvis fell off. My parents, my 16-year-old brother and I sat and waited for the show to start. However, it wasn’t long before a woman offered my brother $100 to trade seats. $100? In the mid-1970s? That was a fortune. She explained that she had been kissed by Elvis numerous times and wanted to be in position to get kissed that night. My brother got the money, and my dad moved to her seat. Soon, the lights went down and screams could be heard throughout the arena. I don’t know who the screamers were, but they must have been disappointed when a comedian came on stage. He told jokes that I don’t remember. However, I got the sense that no one was really listening to him. I couldn’t take my eyes off of him. In fact, I remember him more than I do Elvis. The comedian finished his show, and the energy of anticipation returned to the building. Then, I remember the room being dark as this cool music began to play. As it got louder, Elvis walked onto the stage. I was totally disappointed. I thought he would come out in a white suit like he was famous for. Instead, it was blue. The suit must have thrown off my interest because I can’t remember much of what happened after that. I waited until he sang “Hound Dog”, my favorite song, and sang along with him. My lack of memories about his performance could be attributed to several things I reckon. Maybe it was my age. Maybe I was sleepy. But, it was probably the women that were around. Instead of watching Elvis up on that high stage, I watched women hide behind our seats and try to jump onto the stage when the guards weren’t looking. There was a bunch of them, but they all got tackled in midair and sent back to their seats. However, that is nothing compared to what happened later. My next memory is waiting at the car for my dad to arrive and watching a helicopter take off. I have always wondered if Elvis was on that flight. Then, I threw up. Because of that experience, I have always had a fascination with Elvis and his life. I have visited Graceland several times and went to a concert during Elvis week. Elvis sang on the screens as his original band played. For the first time, I got a sense of what the people at my first Elvis concert felt. I have been to many shows, and a dead Elvis gave a more riveting performance than 90% of the alive acts I have seen. I recently read “Last Train to Memphis” and “Careless Love”, a two-volume biography of Elvis, and found the time when I saw him very interesting. The comedian had gotten booed off of several stages for making racist jokes and not being funny. But, Elvis loved him and refused to let him go. This was also a time when Elvis was in terrible health. Most people thought he was fat, but that is not the case. Drug abuse had caused massive constipation and inflammation of his intestines. At the same time, his abdomen muscles were weakening. Elvis’ “fat” was actually his intestines bulging out through weak muscles. In this kind of condition, Elvis refused to record any usable material. The only way he could make a living was by touring. He would go on short tours to smaller venues, an assurance that he would sell out. Then, he would rest for a couple of weeks and go on another short tour. Elvis died a couple of years after I saw him perform, and I realize that I saw a shadow of the man. That’s what fascinates me. He hypnotized a crowd with a sickly, poor performance. Women, including my mom, were going nuts over an unhealthy, bloated drug addict who couldn’t remember the words to his own songs. If he had that kind of charisma at the end, then what must he have been like at the height of his powers. I wish I could have seen him then because he was truly the “King”. Today is the anniversary of Elvis Presley’s death. This post is from the early days of this blog and recounts the time I saw him in concert. The image of your mother in a cat fight with a green scarf made me chuckle. Does she still have it? We’ve laughed about it for years. Surely, it is somewhere, but I haven’t seen it. What a pity! She must have it in a box somewhere. No way would she throw that away…. I wish I could have seen Elvis in concert. Sad,I didn’t know how sick he really was at the end!! My Mom would have done the same!! Her home is almost a shrine in memory of Elvis!!! I’m glad I got to see him. It’s an experience that not many people were able to have. We have gotten a lot of laughs out of that fight.